The following article is written by Senior Associate Travis Ewen and is part of our new series titled: Project Spotlight. 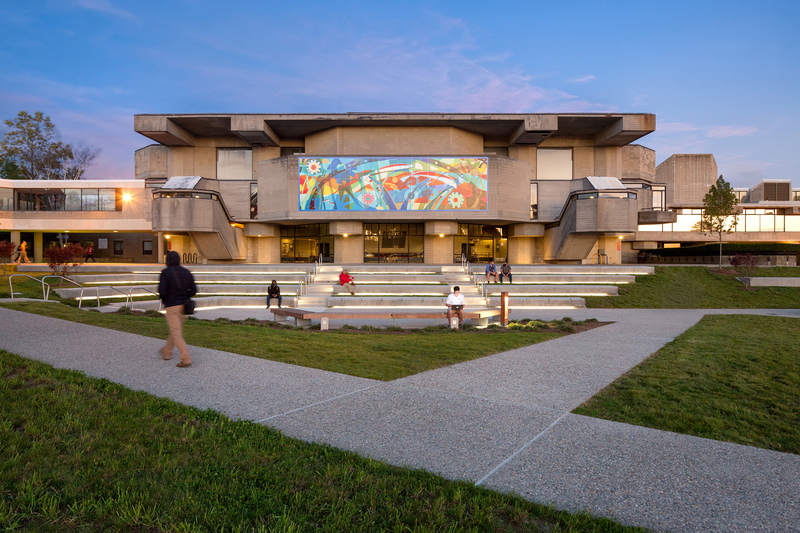 Travis, who was the project manager, discusses how the CRJA design team re-imagined an iconic Brutalist-era monumental stair in the heart of the University of Massachusetts Dartmouth campus in order to meet the current and future needs of the university. 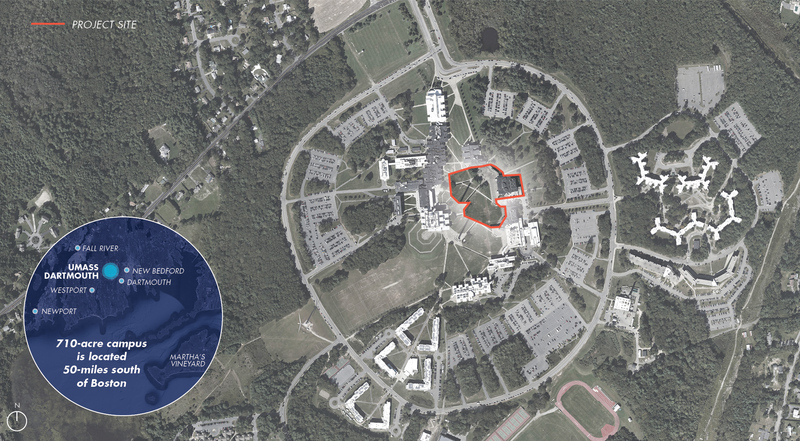 In 2015, after our work on the University of Massachusetts Dartmouth (UMD) Campus Master Plan (CMP), this area of the Main Quad in the campus core was recognized as a vital “missing link” in creating accessible connections and identified as a priority improvement project for the Main Quad. 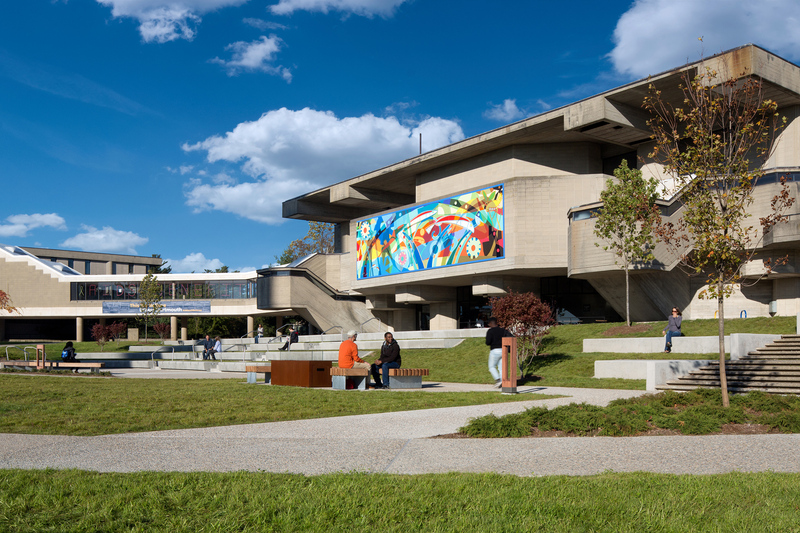 The opportunity for implementation of the CMP recommendations was realized when a steam line needed to be replaced requiring the partial demolition of a Brutalist-era monumental stair. 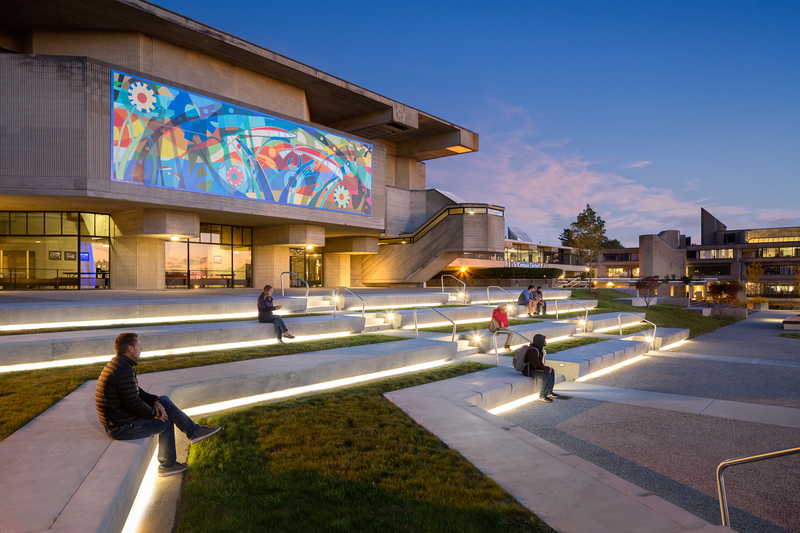 Our design transforms the vast concrete stair and plaza into an accessible, outdoor social space that connects the east and west side of the campus core while still honoring the original design intent of anchoring the adjacent Auditorium building atop a plinth. Respecting the historic mid-century minimalist design, the reimagined plinth is a design of simple forms and materials. The design builds on the existing architecture’s interplay with shadow, light and materials. 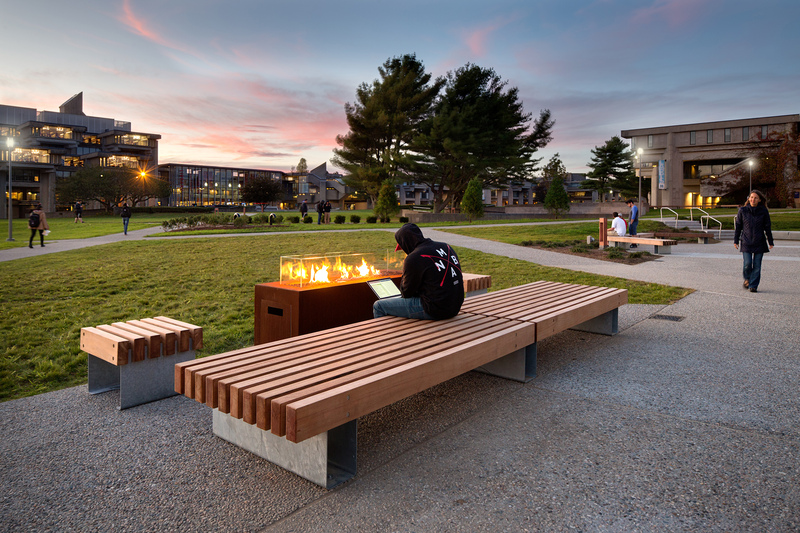 This outdoor space serves as a new typology on campus, encouraging social interaction and allowing students to enjoy the outdoors year-round. 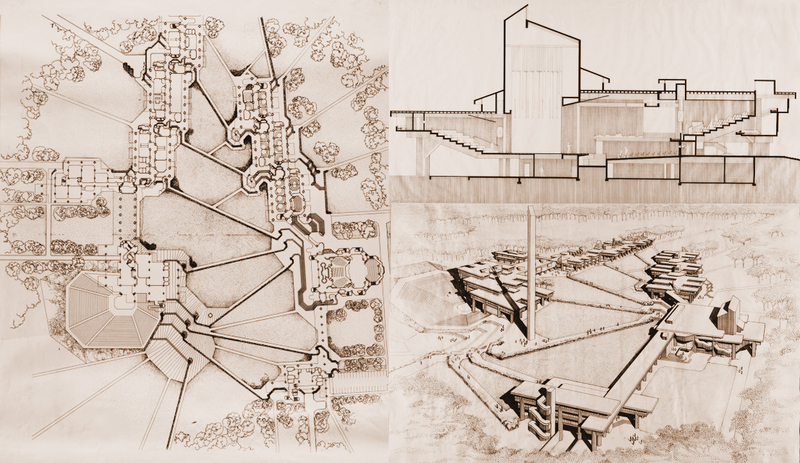 In 1964, world famous architect Paul Rudolph designed one of the few examples in the USA where a single architect designed an entire campus in the Brutalist style. 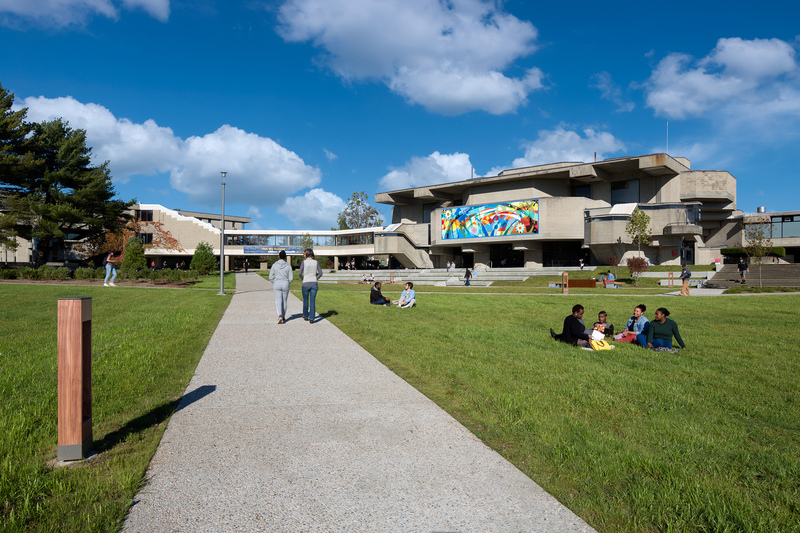 Consequently, UMD’s palette is dominated by concrete. The concrete on campus is at once unifying and monotonous. Unfortunately, Rudolph’s Utopian vision had the unintended consequence of creating internal building-centric spaces at the expense of the exterior landscape. 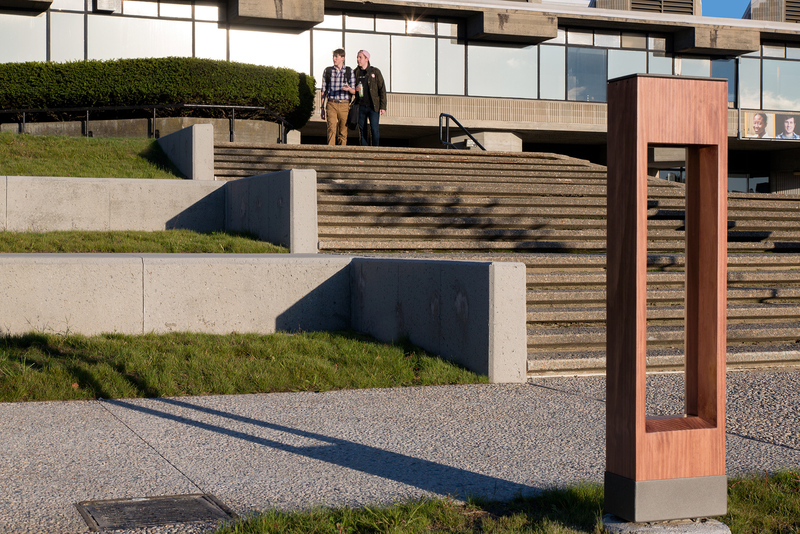 Prospective students and visitors to the campus have consistently remarked that circulation patterns and the material palette is intimidating and uninviting. The existing Auditorium building hovers over the Main Quad landscape with each floor rising above the next like an elaborate Futurist stage set. 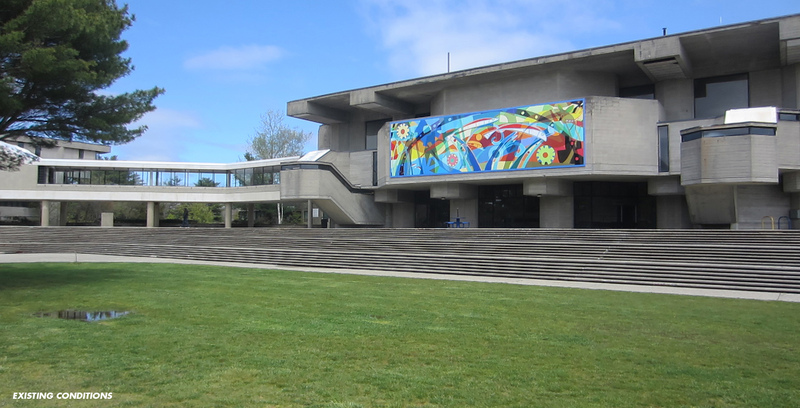 The cantilevering elements create dramatic shadows and allow the building to appear to float above the plaza. 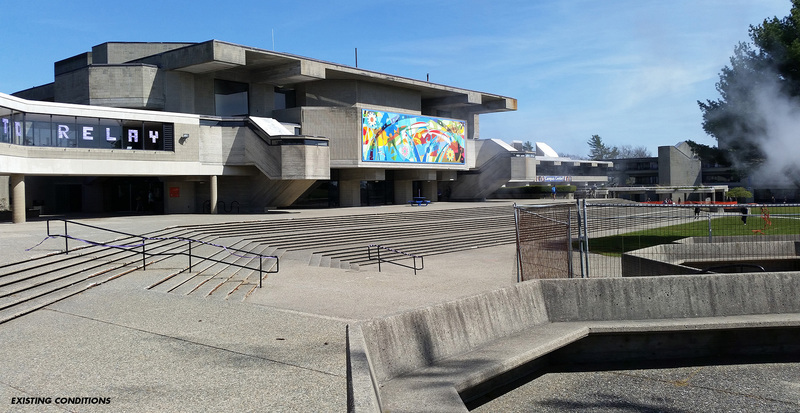 The Brutalist steps were primarily serving as a visual plinth and not for functional circulation and were therefore underutilized dead space on the Main Quad. This muscular approach to siting the building places it well above the surrounding landscape and the design team feared that losing these steps to demolition would destroy the relationship between building and landscape. 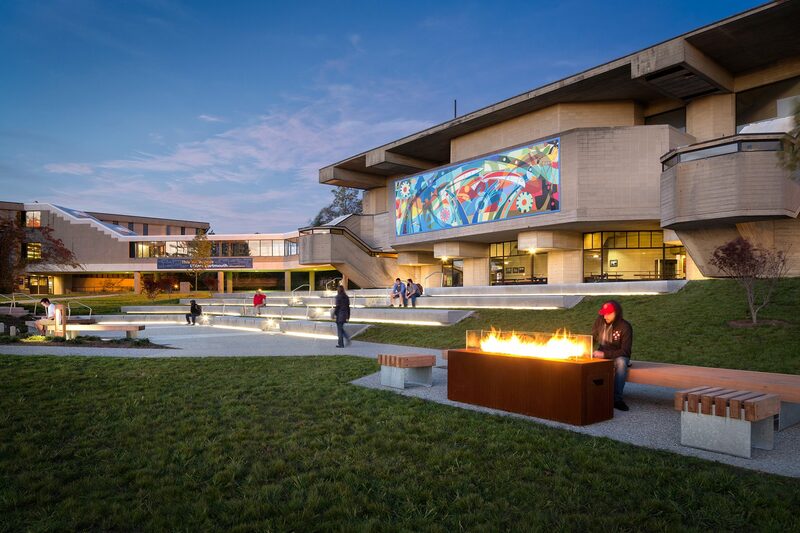 The re-imagined plinth preserves the visual base for the Auditorium while activating this edge of the Main Quad using amphitheater steps and a fireplace to accommodate multiple campus functions. New pathways and subtle grading provide universal access where there was none. Through careful study and research, the site design mitigates the grade change by using robust cast-in-place seatwalls nestled into the landscape. The profile of the walls create a shadow line during the day and are vibrantly lit at night, playing off the shadows in the building cantilevers. Each seat wall aligns with the landings of the original stair preserved to the south. To the north, beyond the edge of the auditorium, the original steps were replaced with sloped walks to provide universal access for the first time. 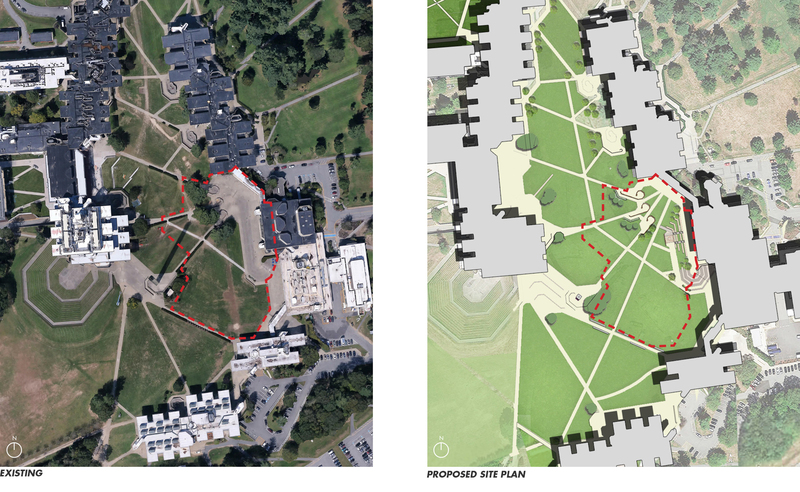 The new paths splay in radial form, echoing Rudolph’s original layout of paths within the Main Quad. We paid homage to Rudolph through the use of muscular concrete forms; but warmed this up by using cor-ten steel, wood and a fireplace nook. 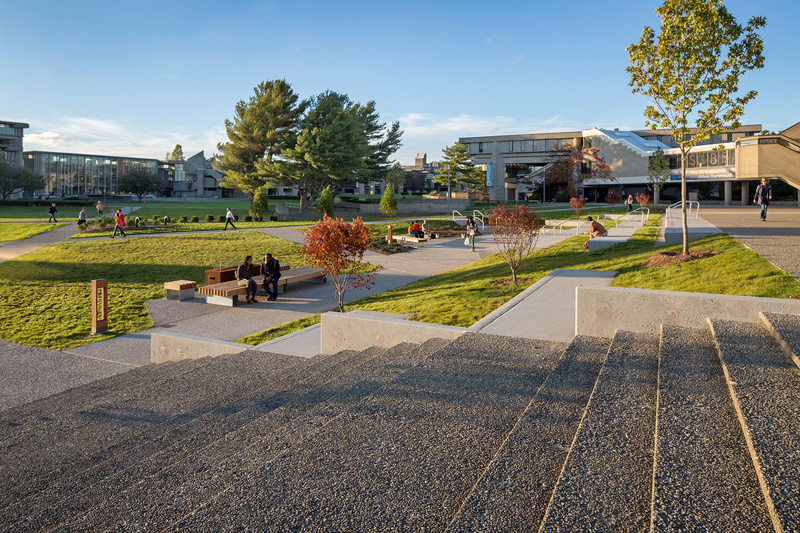 Respecting Rudolph’s recommendations for minimal tree planting on the Main Quad, we introduced only a minimal planting of shade trees to frame the building and landscape. Sweetgum, Sugar Maples, and Japanese Maples were selected for their seasonal color against the Brutalist concrete backdrop, as well as their fine grained texture. The result is an immediately recognizable activity node on the Main Quad. 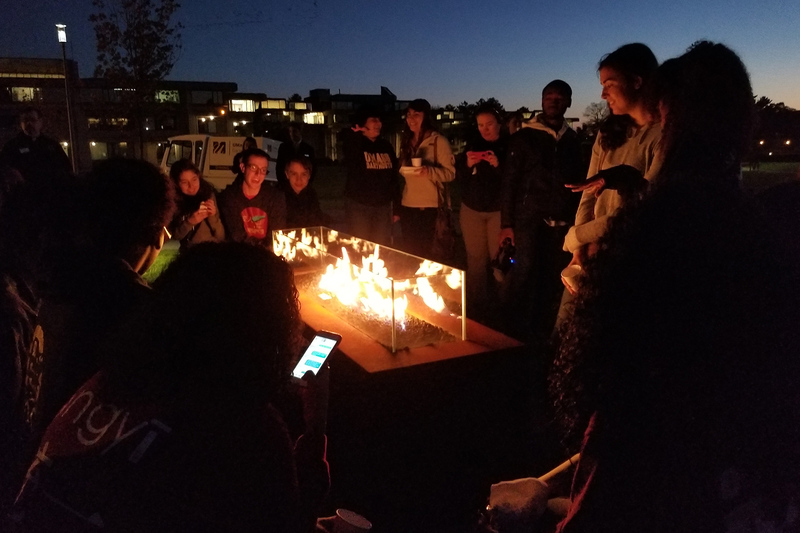 The university leadership wanted to create spaces where students could engage with each other. 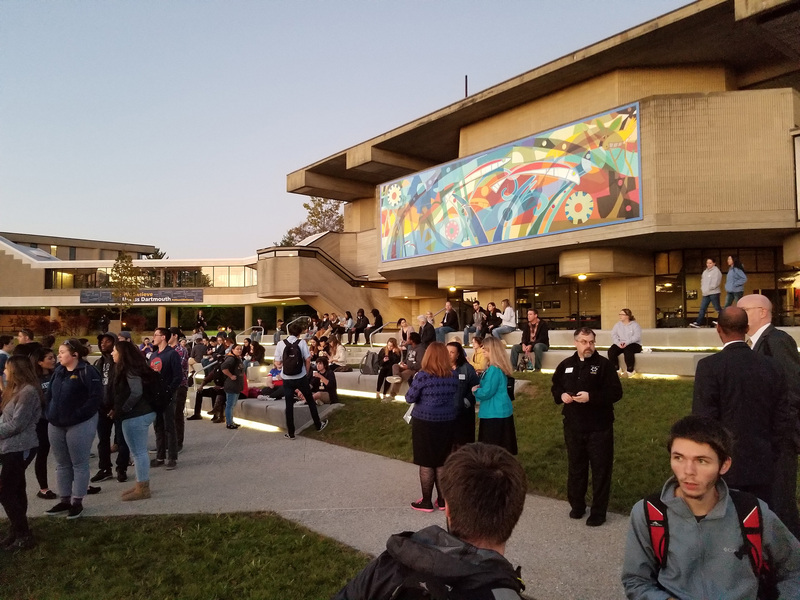 The space was organized so that students could have impromptu performances or just sit on the walls together and soak up the south-west sun. 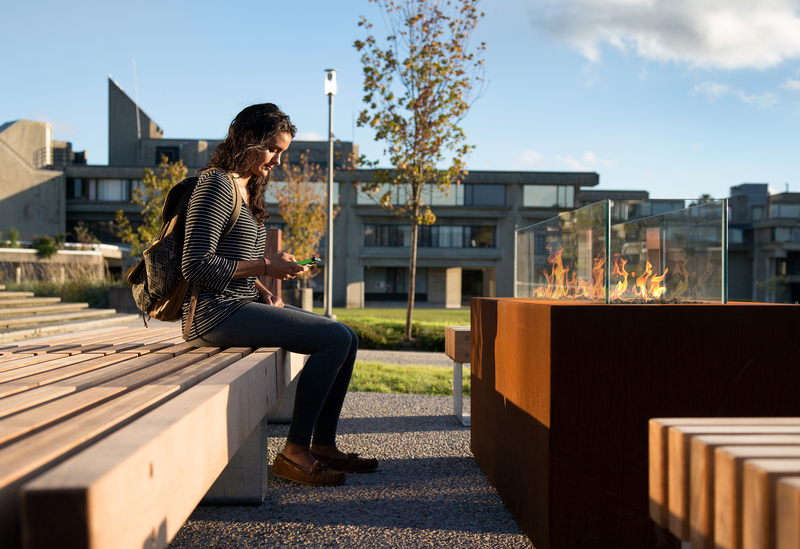 The fireplace has become a major social attraction on campus where students flock to when it is in use. This proved out during the initial igniting of the fireplace, many students gathered around to see it in action. Special attention was given to lighting the space in a whimsical way and to bring it to life at night. 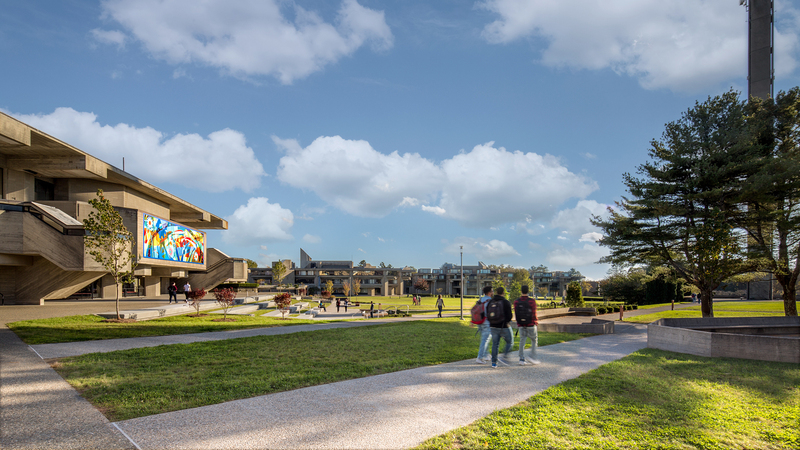 Our design creates a student and visitor experience that shows what is best about the university by framing key views with seating and planting. 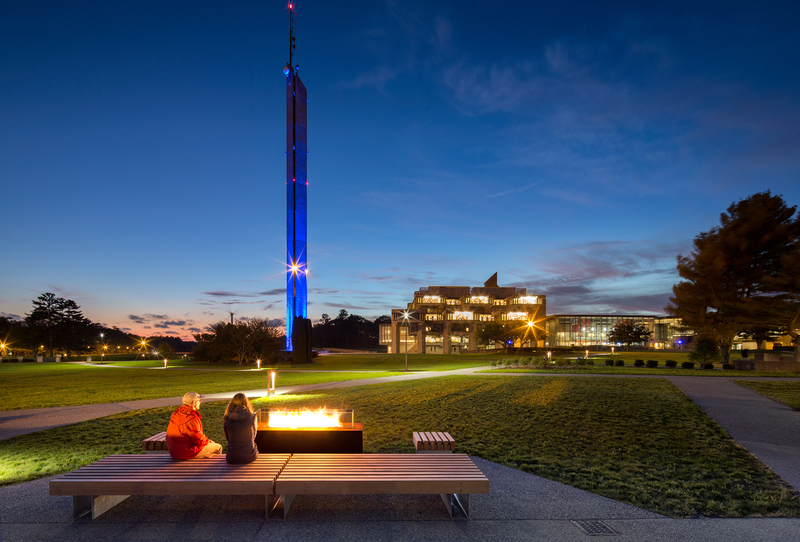 As the lead landscape architect, we worked closely with the university and stakeholders to provide an outdoor space that encourages year-round spontaneous celebration while recognizing that Rudolph’s legacy should be understood, embraced and adapted to the current and future needs of the campus. 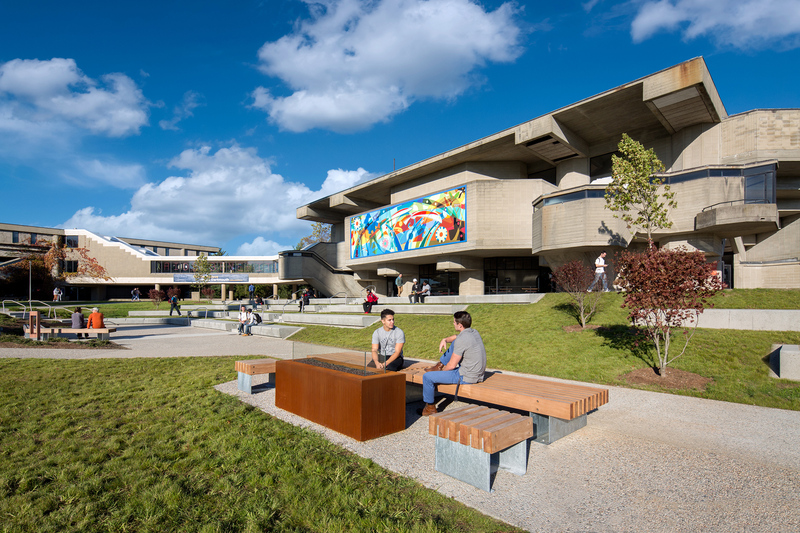 This project is an example of how re-imagining mid-century Brutalism can bring social engagement and new life to once maligned landscape spaces.